Make those PB M&Ms and I'm right there with you! Great, now I want some M&M's. Thanks! Is that the mini bag like for Halloween? That's TWO servings?? Lisa - it's not the mini bag. 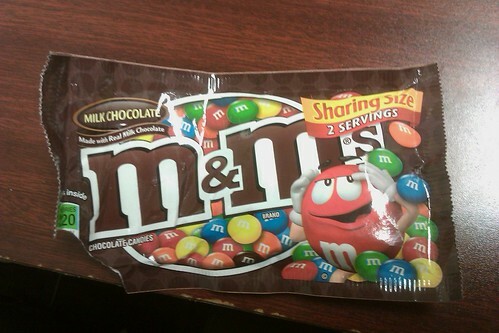 It's slightly taller bag than the normal M&M bag. hahahahaha, that is hilarious! I can't believe they print that on there! I just bought two full bags of valentines days m&ms to "look pretty" in the heart glass bowl that I have and maybe make m&m cookies. Hah! Who am I kidding, I eat a handful every time I go by!